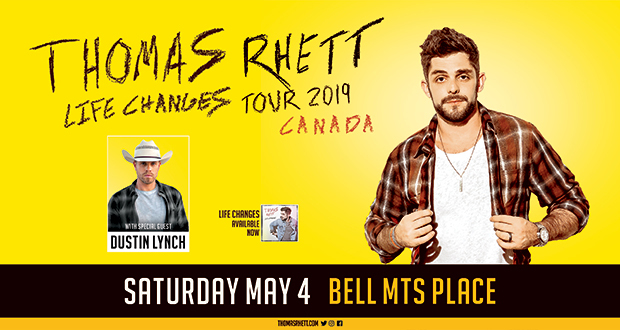 Current multi-CMA Awards nominee Thomas Rhett is continuing an unstoppable run on his LIFE CHANGES TOUR, announcing a 2019 leg in Canada which includes a stop in Winnipeg on Saturday May 4th. Taking his “contagious energy” (Tennessean) and “awe-inspiring” (Billboard) set north, the “talented performer, songwriter and all around star” (Forbes) will bring PLATINUM-selling artist Dustin Lynch along for the ride. “My fans in Canada are incredible, so I’m really excited that we will be headed there for a couple weeks next year and get to bring all the energy of the Life Changes Tour with us,” Thomas Rhett said.